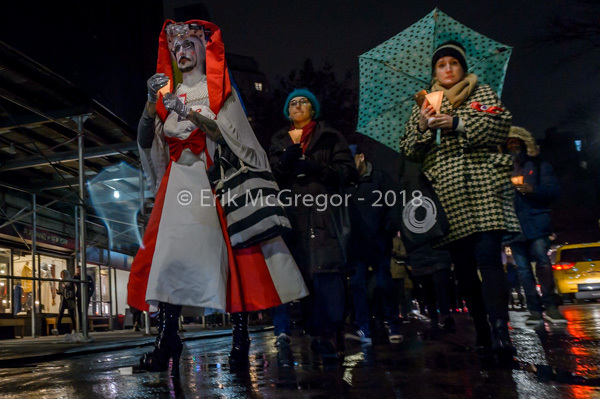 New York, NY – ACT UP New York took to the streets on December 1, 2018 to draw attention to World AIDS Day, an international recognition of the HIV/AIDS epidemic. 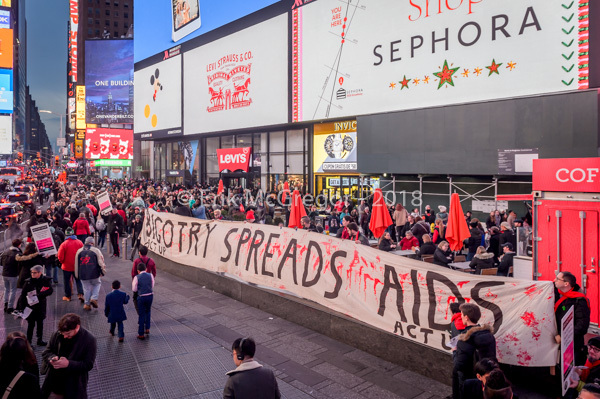 ACT UP NY staged a speak out in Times Square to emphasize: people with HIV and AIDS are still here fighting for the end of the AIDS epidemic in New York, the US, and around the world. 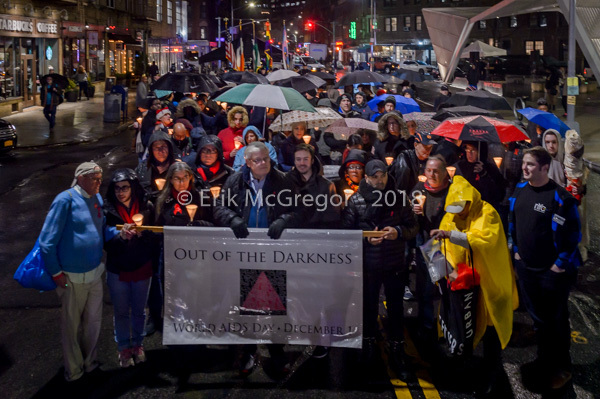 The action was followed by the Out of Darkness candlelight vigil and march at the NYC AIDS Memorial to remember those lost on World AIDS Day. An American still dies of AIDS roughly every eighty minutes — so why do so many Americans think the epidemic is over? 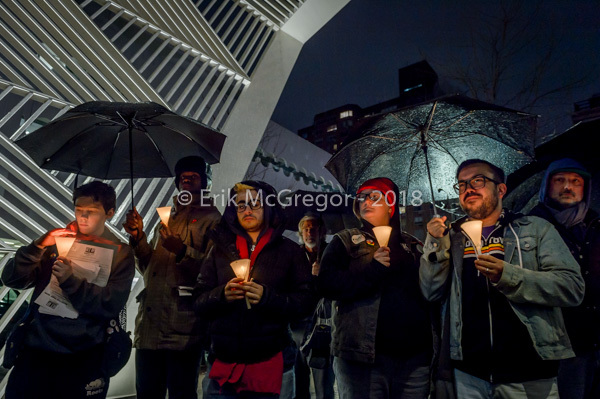 For the 30th annual World AIDS Day, ACT UP New York staged actions in Times Square and at the AIDS Memorial to call attention to the fact that, in many American communities, HIV rates are not dropping. Holding a banner that read Bigotry Spreads AIDS and signs that quoted the CDC’s own statistics about the state of the HIV epidemic in America, members of ACT UP called on the CDC to make a plan for HIV prevention that will stop HIV outbreaks related to opioid use, and also reach underserved Black- and Hispanic-American communities, where HIV rates remain much higher than the national average. 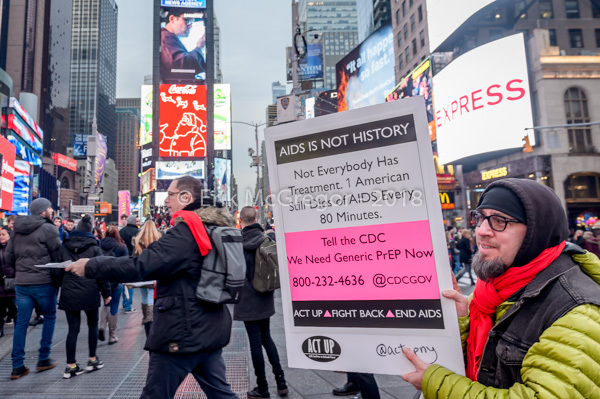 They reiterated a suggestion AIDS activists from various organizations have been making for several months: that the CDC use its power as a federal agency to break Gilead Sciences’s patent on Truvada as PrEP. PrEP, short for pre-exposure prophylaxis, is a once-daily pill that is more effective than condoms at preventing HIV transmission. It can also cost patients and insurance companies over $1600 per month — despite it costing less than $10 per month to manufacture. 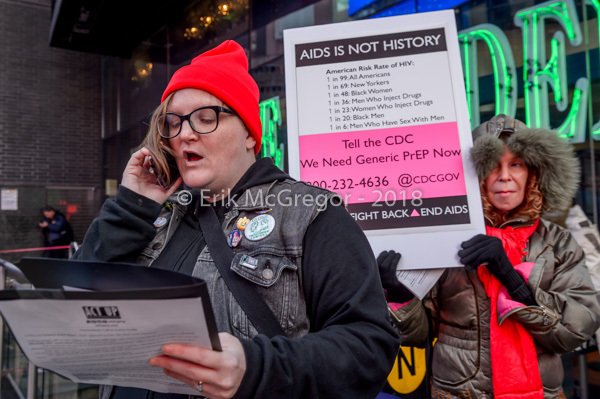 Though generic PrEP would not automatically stop transmissions, making the only HIV-prevention medication cheaper would remove a major barrier to access for many. 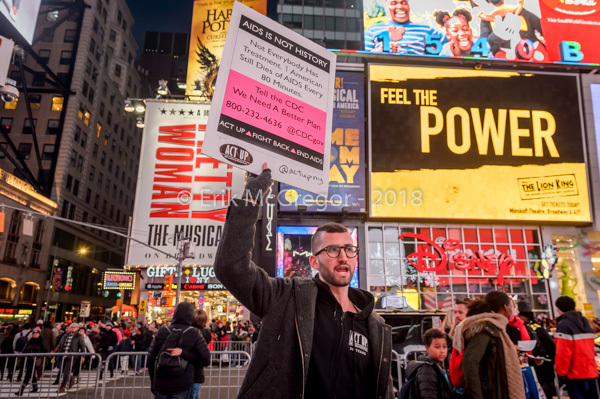 ACT UP stated that the programs in place to help people pay for PrEP are insufficient, and asked the public to contact both Congress and the CDC to demand generic HIV prevention medication. The CDC estimates that ten times as many people as are currently on PrEP would need access to the medication to limit transmissions. 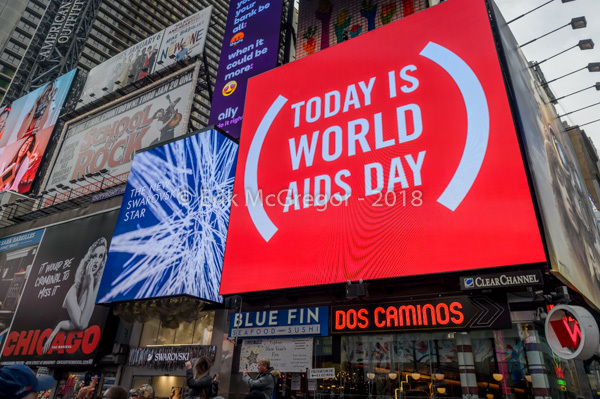 According to the CDC’s website, the risk rate for HIV is one in ninety-nine for Americans, but one in forty-eight for black women, roughly one in thirty for people who inject drugs, and one in twenty for black men. 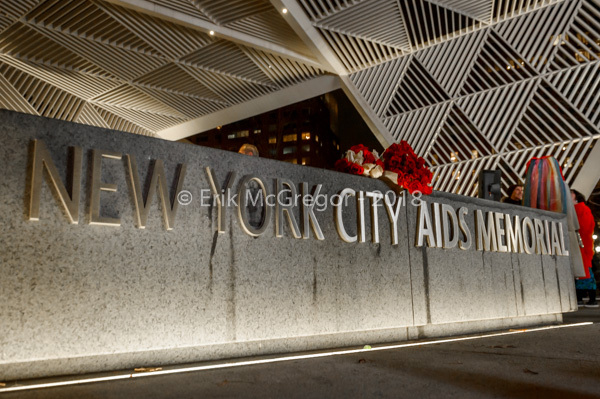 ACT UP, or the AIDS Coalition to Unleash Power, formed to address the federal government’s slow response to the AIDS epidemic. It has been active since 1987.